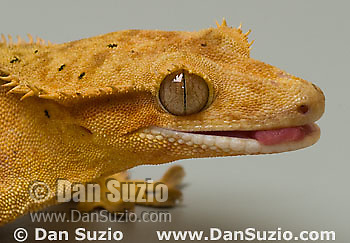 New Caledonian Crested Gecko, Rhacodactylus ciliatus, also called Guichenot's Giant Gecko or Eyelash Gecko. Unlike most lizards, geckos have no eyelids, and use their long tongues to clean the protective clear scale that covers the eye. Endemic to New Caledonia in the South Pacific, the crested gecko was thought extinct until it was rediscovered in 1994. It is now one of the most commonly kept species of gecko in captivity. .